A First Alert Professional Security System is greatly enhanced with the added benefits of central station monitoring. The Beam Center (a First Alert Professional Authorized Dealer) can provide you with central monitoring services. At the central station, trained professionals are on duty 24 hours a day, seven days a week watching over your security system. If your First Alert Professional Security System detects an event, such as a fire, intrusion, or panic button notification from a night worker, it automatically transmits a message to your central monitoring facility where highly skilled operators respond. In most cases, they will attempt to verify the condition by calling you before contacting the appropriate authority. Why would they verify the alarm first? This prevents having the police, fire or emergency service come to your business unnecessarily. If it is a verified emergency, the operator can summon the appropriate emergency personnel to your business to assist you. So your business can be protected 24 hours a day, every day. 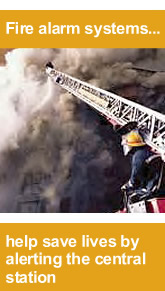 Fire protection is completely maximized with First Alert Professional fire monitoring systems. Our fire alarm systems help save lives by alerting the central station that there is a fire. Our central station can contact you and the fire department giving you the best all-around protection possible. It is your obligation to protect your employees and assets from this deadly threat. Our fire detection systems allow for affordable and reliable protection that complies with stringent fire codes. Our UL approved manual pull stations allow for the manual activation of the system. Our supervised smoke detectors give you additional protection. Supervised smoke detectors have the ability of sending a supervisory signal to your panel indicating the obscuration level has reached a threshold that may cause a false alarm if maintenance is not performed. An obscuration level can occur with too much dust. You may also want to consider our waterflow supervisory systems to prevent your location from water damage. They report to the central station whenever water begins to flow through a sprinkler. This allows you to minimize the effects of water damage that can be even more expensive than fixing the fire damage.